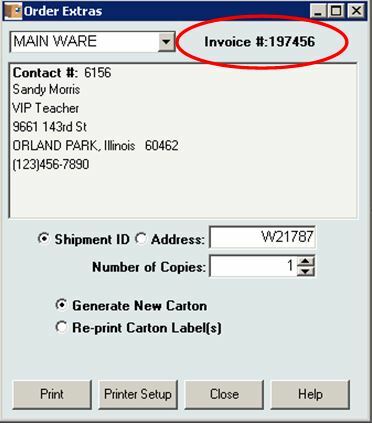 When you first open [Order Extras], a blank Invoice # field is available. Enter the carton or warehouse shipment I.D. in that Invoice # field and press Tab or Enter. The Invoice number is displayed, along with the customer contact information. We know that InOrder’s RF capabilities are impressive, like the fact that it supports any internet-capable device. As always, we’re constantly making improvements, and InOrder RF is no exception. We added RF functionality for Guided Picking, Guided Putaway, and Item Counts. Here is an overview of the new Guided Picking. 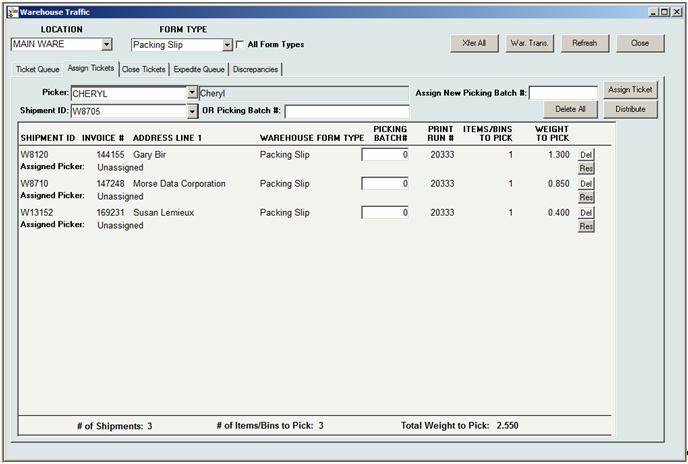 To generate guided picking tasks, orders are entered and printed according to the normal order processing procedure. Then warehouse shipments are quickly and efficiently batched / assigned to pickers by a Warehouse Manager. On the [Warehouse Traffic] window, the Assign Tickets tab has been updated to accommodate the new RF functions and assign the tickets to pickers to begin immediately. The assignment process starts a timer that evaluates how long a picker works on the assignment. Currently, the warehouse manager scans one shipment I.D. at a time to assign them to pickers. Alternatively, a new picking batch number already assigned to the batch may be entered. 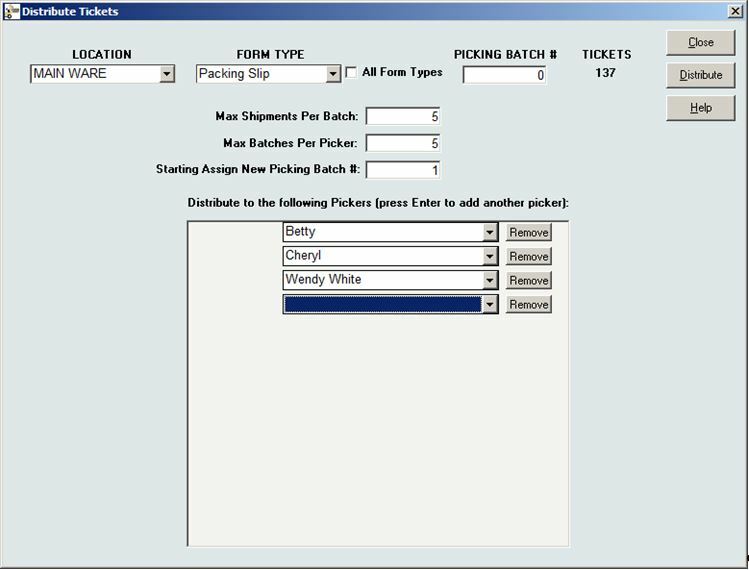 Optionally, a picking batch number may be used to group / batch orders to pick or putaway together. Using customized Crystal Report forms, different processes for this can be conceived. For example, cart picking, when your cart summary includes peel-off shipment I.D. labels for each cart slot, allowing you to forgo printing pick tickets. Tickets may also be assigned in bulk to several different pickers using the Distribute Tickets feature. 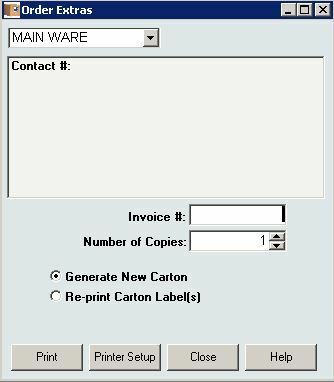 This feature is useful for assigning putaway tasks, or for picking with a Crystal Report that prints shipment I.D. labels by picker after they are assigned. When RF transactions have been assigned / distributed, the RF personnel picks the batch by first scanning the barcode label of the bin from which an item is being picked, then the barcode label and quantity of the item. (One or more of these scans may be bypassed using security privileges.) Items are then Putaway to the packing area, where they may pack verified, if applicable. For example, when you are picking an inventory transfer (e.g., using cart picking), you walk through the warehouse picking all the items in your batch. When you are done, you tell the system by putting the items away (e.g., a ‘pack’ bin for cart or batch picking). Watch for future articles for more great RF features. But if you can’t wait, just call us and we’ll tell you all about it! We first introduced Adeel when he was an intern at Morse Data. He started here in December of 2010, and was with us until he graduated from DePaul University in June 2013, with a Bachelor of Science in Computer Science. After spending the last year working in the grocery supply software vertical market, Adeel will be joining us again, starting this month, and we are excited to welcome him back as a permanent member of our team. Super heroes always stand above the crowd and are favorites because they can do amazing things. 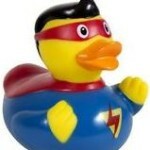 Here are just a few of the many ways InOrder reminds us of these super heroes. Batman – Both are always available to save the day when a crisis arises. Captain America – Both have the determination and ability to improve. InOrder is always improving and adding surprising new tricks; just check out our blogs for some of our newest features. Our customers also get our monthly InOvation for a more thorough overview of new features. Green Hornet – Both have a sidekick who helps them along to solve the problems of the day. 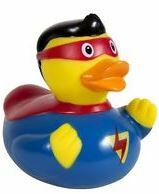 InOrder’s sidekick is Crystal Reports. The Hulk – Both have incredible strength and can handle unexpected workloads. Iron Man – Both are smart, and can conquer just about any order, warehouse, or customer challenge. Superman – Both are sighted in many places. InOrder can be seen operating in many places from Maine to Hawaii, from New York to Chicago to LA, all along the east coast and as far Northwest as Portland, Oregon. InOrder has even been seen operating in several European countries as well. Teenage Mutant Ninja Turtles – All are willing to go the extra mile to help you. Wolverine – Both have a complex history that resulted in success and made them what they are today, with experience and wisdom that others don’t have. Wonder Woman – Both have amazing versatility and can adapt quickly to do what is needed. What other super heroes can you compare with InOrder? 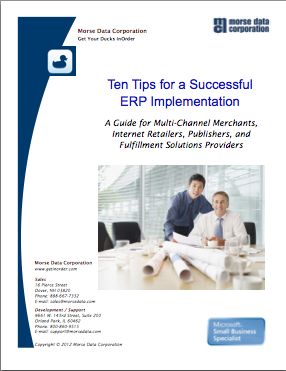 Click here for more ways InOrder can help with your Enterprise Management. PCI DSS contains requirements for the protection of stored cardholder data using cryptographic keys. These keys must be changed at least once a year. This is a straightforward procedure for you and your key custodians using the InOrder Key Management Wizard. The network administration / security personnel, along with the designated Key Custodians, run the InOrder Key Encryption Wizard to change the key. If a key is old or suspected to be compromised, it is replaced. This procedure is audited by the system so your PCI QSA can confirm it has been done. Please refer directly to PCI DSS for your responsibilities under these requirements. If you have specific questions relating to your responsibilities for PCI DSS compliance, please direct them to your Qualified Security Assessor (QSA).